1. 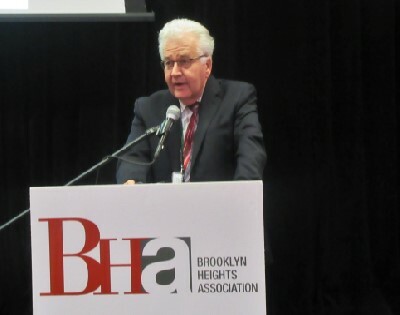 The featured speaker, DOT Deputy Commissioner Robert Collyer (photo) said at least twice that a primary DOT concern is keeping traffic off Brooklyn Heights streets during the BQE renovation. 2. Mr. Collyer said that DOT is considering creating alternate routes for traffic during the BQE project that wouldn’t affect the Heights or other residential areas. 3. One of the objectives of the BQE project, according to Collyer, is to “improve [vertical] clearances” on the highway. Some residents asked if this would necessitate raising the BQE roadways, thereby affecting the Promenade. Mr. Collyer said it would not, and that the preservation of the Promenade was of vital concern. 4. When asked about the proposal to create an entrance to Brooklyn Bridge Park from Montague Street, the BHA took no position for or against. Mr. Collyer also remained neutral, but noted the long drop from Montague to the level of the Park and that any entrance/exit would have to comply with the Americans with Disabilities Act. 5. The BHA is considering options following the court decision allowing construction to proceed on the two high rise residential towers near Pier Six in Brooklyn Bridge Park, including a possible appeal. There’s not much more room for traffic on Heights streets. Clinton already is nonstop gridlock from about 8-4 every day.